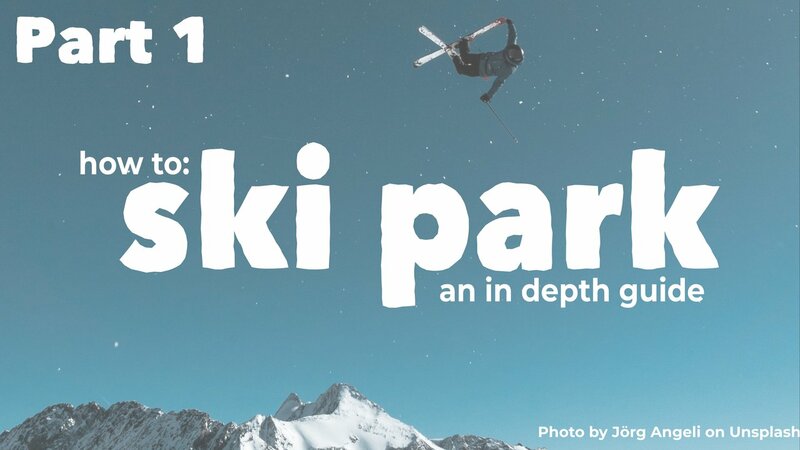 This was originally a thread in ski gabber but I thought it would be cool to redo it as a series of articles, from beginner tricks up to more advanced stuff. I should start by saying that I am not an expert. I am a freeride and park coach and have been coaching for the past 6 years, I still learn new things everyday about how to coach and what works for different people. This is not the only way to get into park just one method that I have found works well. - Look before you leap. Check your landings and make sure the feature you are using is clear before you hit it. - Call your drop. 1 person on a feature at a time. Make sure you check uphill before dropping and call out loud and clear so that others are aware of you. - Respect and obey all park signage. If a feature is closed it is closed for a reason. Do not hit it. There are many horror stories of people disobeying this rule but those could be a whole other thread. - You are responsible for your own safety. Do not hit any feature that is beyond your ability level. Always do an inspection run the first time around, features and conditions can change daily depending on weather, grooming and traffic. - Always follow the Alpine Responsibility Code. Another big point is that features should only be used the way they were designed to be used. The park crew spend a lot of time working on features and it is super frustrating when you see people ruin all their hard work by misusing features. For example, the lip of a rail/box is just that, a lip. It is not a jump and should not be used as jump. Side hitting wears down the takeoff and makes it uneven for people who actually want to hit that rail/box. If you want to do jumps, hit the jump line. It is super important to stretch before attempting anything in the park. Stretch all of your muscles, starting with your legs. You can do lunges, squats and hip rollers among other leg stretches. Try to incorporate as many kinetic stretches as you can rather than static stretches. Stretch everything right up to your lower back, upper back, arms, neck and core. Stretching will greatly reduce the chance and severity of injuries should you bail. It is best to learn the following tricks outside the park and get really comfortable with the progressions and the mechanics before taking it into the park. Think of the park as a performing ground to perform the tricks that you have worked on outside the park. I suggest using a gentle green/blue run that is well groomed and preferably one that has some natural rolls and berms. Start on a flat area of ground while stationary and practice popping. You should be centred on your skis. This means that you are stacked. Your shoulders are over your knees and your knees are over your toes. This is achieved by bending all the joints in your legs evenly. Ankles, knees and hips. You should have even pressure across the bottom of your feet and feel your shins pressing slightly into the front of your boots. Crouch in this position and then extend all you joints as explosively as possible. Start at the ankle and work up, this is the most effective way to use the power stored in your legs and skis. Make sure your ski lifts off the ground level. Shifty - twist your legs one way and your upper body the opposite way then release. Spread Eagle - basically a star jump. Cossack - spread eagle but you put your poles between your legs. Iron Cross - point your toes together to cross your skis then release. Tail Tap - pop and then as you are in the air, lift up your toes and tap the tails of your skis on the snow before landing. Start to look at basic grabs: Safety, Mute, Tail, Japan, Critical. Mute - Reach across your body with either hand and grab the outside edge of the opposite ski just in front of your boot. Tweak this by pulling your ski overtop of the other one to form a cross. Tail - Like a safety but grab behind your boot. Japan - Reach behind your back and grab the inside edge of the opposite ski. Critical - Reach forward with either hand and grab the inside edge of the opposite ski. Try the grabs while standing stationary on the snow or by laying on your back. Try to 'meet in the middle' you should lift your ski/foot and bend down at your hips an even amount to compensate. Focus on looking up and feeling for the grab rather than looking down and trying to see it. This will help with balance when you are in the air. Try these grabs while sliding on a flat area of snow without a pop. Then once you are really comfortable with the grabs and staying balanced you can try them on a small jump. Don't worry about grabbing the ski, focus more on the movement, staying balanced and just touching your ski/boot. Remember: pop, manoeuvre, landing, in that order. Common Mistake - Looking down at your feet will put you out of balance and can lead to over bending your hips. Remember to look up and ‘feel’ the grab. Next try popping while switch. The same as above applies. This is a great way to see if you really are centred or not. The first air to learn is a 180. This can be done by either turning your legs under your body of by setting with your shoulders. Try both. Also try doing them in both directions. We all find it easier one way but this is purely psychological and can be overcome. Good technique is good technique and will work either way, left or right. Remember: pop, manoeuvre, land. 360s are a little more scary and should be set using your upper body. Confidence is key and if you visualise yourself landing it you most likely will. Don't doubt yourself. Start with some surface 360s on the snow. Practice a dummy pop followed by twisting your shoulders and hips in the direction you want to spin. Keep your skis as flat as possible to help you slide on the snow. Try these both ways. Timing is really important. Your shoulders should be aligned with your skis at the time of the pop. Practice this too. Once you have surface 360s nailed, try adding a real pop, jumping to about 90 degrees and then scrubbing the next 270. Again make sure that you have a solid strong pop. Gradually work you way up to a 180 scrubbed into a 360. Make sure that there is no pause as you land from the pop. This is only achieved if you maintain the separation between upper and lower body and keep your skis flat. Keep your shoulders and hips twisting until you reach 360. This can all be done somewhere flat without a jump. If you can, try popping 270 and scrubbing the last 90. With practice it is easy enough to do a 360 on a flat piece of ground without a jump. When you do take them to small jumps, just ensure you treat it the same way and you will make it round. Keep your eyes out and up for balance. Don't look down at your feet, this will make you land backseat and you will get shin/toe-bang. Try to set your spin from a wide stance off of your inside edges, this will help you push off the snow. Start with a short, flat, wide, box. A 50/50 is simply when you ride along a box straight without doing any kind of spinning. Common Mistake - Trying to snowplow or use your edges on the box. You will fall over. Start by practising some side slips. Next try popping and jumping 90 and landing in a slide. Do this on any moderate slope that is well groomed outside the park. This will give you a good idea of what sliding a box or rail sideways will feel like. Make sure you stay stacked, that you have the majority of your weight on your front foot and that you use as little edge as possible. Keep your skis flat to the snow. This is achieved by pushing your hips sideways down the hill. Think about keeping your downhill hip over your downhill foot. Common Mistakes - Letting instinct take over and trying to do a hockey stop or leaning back (uphill) while on the box. Let your skis slide and stay on your front foot. Not popping and trying to turn onto the box. In order to come off a box, you need to be aware of your body position on the box. If your downhill shoulder is slightly behind your front foot you will come off forward. This can be achieved by using the leg twist method when mounting the box. If your shoulder is slightly in front if your downhill foot whilst sliding, you will come off switch. This can be achieved by setting your spin on with your upper body. Practice coming off both regular and switch on demand. Common Mistake - Bringing your hands across your body which can lock your rotation and stop you from spinning off a box, try to keep them out to the sides. Not popping off the end of the box, although not essential it is a good habit to have as it will help with learning spins off. The most important thing of all is a pop. It is the basis of all tricks. Go slowly at your own pace and don’t try anything that you don’t feel comfortable/ready for. I hope this can help all those who are just getting into park. I am stoked to see so many people getting into freestyle and helping the sport to grow!